Adventure is a path. Real adventure – self-determined, self-motivated, often risky – forces you to have firsthand encounters with the world. And the real adventure starts and ends in Nepal. It is a tiny pepper of a country with the variety of a continent. The towns are cozy, villages are green, terrain is challenging even to the brave, the religions take a back seat and the people warm. It isn’t just trekking or mountain climbing that they boast upon. They need to be seen no doubt but these other activities just cannot be missed. So go over to Nepal and have the time of your life because The World is a book, and those who do not travel read only a page. A Nine days Paddle down the Sun Kosi River. Getting Blessed by a living goddess. Spot Bengal tigers, wild Asian Elephants and one horned Rhinos. Experience the Healing effects of natural hot springs. A rural home-stay is the best way to know the locals. Ride a local mountain bus — preferably on the roof. Get drunk on local chhang or raksi. Trek, raft or fly through the deepest gorge on Earth. Experiencing one of the world’s best-preserved Tibetan cultures in Mustang. Besides hiking trails, Nepal is also the place for long trip water rafting. The widest river in Nepal called Sun Kosi is among the most visited rafting site for tourists. It will provide you with a multi day rafting event that almost covers 170 miles and takes around 9 days to finish. The rafting route features vast dense jungles, hills, green farming area( terrace rice farming looks amazing), beaches, site seeing of dolphin, villages, local cultural people and then at last you will arrive at the plain area bordered with India. Kayaking can be another excellent way to get the rush. The living goddess Kumari has a place in peoples hearts and given as much respect if not more as the mythical ones. A Kumari is always chosen from and mostly revered by the Newar community. There are several Kumaris including Kumaris in Kathmandu, Patan, Bhaktapur and Bungamati within the Kathmandu Valley. However, among all of them, the Kumari of Kathmandu housed in the Kumari Bihar situated at the vicinity of Hanuman Dhoka Palace at Basantapur is regarded as the most important one and is also known as the Royal Kumari. As a female deity, she is believed to possess Shakti (Power). She is also a living virgin goddess, the defender of the living beings. Pokhara also referred as queen city of Nepal is the place to be if you want to enjoy the mountains from a distance. n a crisp morning you will get beautiful view of the Annapurna Himalayas. But beside site seeing biggest adventure will be paragliding over the city and absorbing the quiet turquoise waters of Phewa Lake and many others. Bardia National Park houses Asia’s largest stretches of tiger habitat. It also means that your chances of spotting tigers are higher, because there is less disruption to their habitat. The national park is also known to produce world’s largest (in size) Asian Elephants every so often. The park offers a rigorous jungle safari experience. The Chitwan National park is almost as big and a more popular destination among tourists. It has alomst 200 Bengal tigers, 250 leopards and 550 one horned rhinos. There is a town called ‘Tato Pani,’ which means ‘hot water’ and that is exactly where you get spots with regular hot springs that arose from the ground and converted into public baths. There are others in the Myagdi District for instance on the Annapurna trekking course where they are cut into rocks close to the Kali Gandaki River. Ladies don’t wear swimming outfits here but normal clothes. Anyway, the relieving hot water is exactly what you require after long, exhaustive climbs and drops in the mountains. Home-stays beat the luxury and special package from hotels. They are additionally a decent approach to meet and communicate with locals. It is cheaper and an show you more of the society and the ways of life. You are also welcome to help out in the everyday chores and in the paddy fields. Though it is illegal to ride on the roof of a traveling bus in Nepal, however, there are lots of things that are ‘actually illegal’ but are done in any case. You’ll feel so thrilled and excited by the fast paced wind passing your ears as you hang on to your dear life. You can definitely get some practice with the city buses if you want. At first, a white haze of cloud cover will obscure the surrounding mountains. Then, as the plane descends, a tiny gray strip at an elevation of 9,100 feet will appear in the distance, almost camouflaged by surrounding greenery. This 65 by 1,500-foot patch of asphalt is the runway. At its southern end is a 2,000-foot drop into a valley. At its northern end, a stone wall and a hairpin turn. 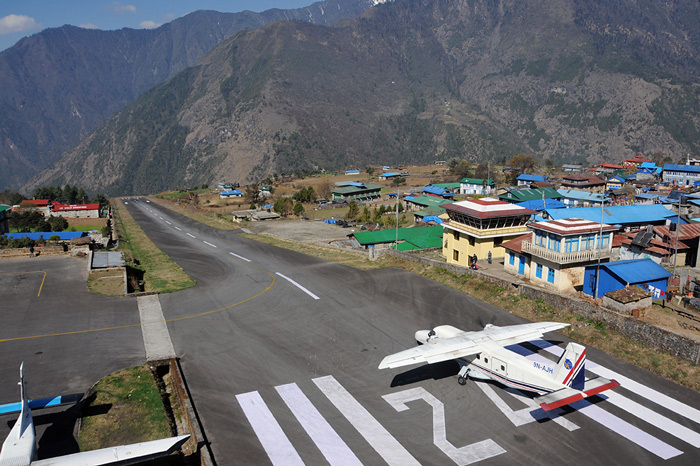 Sure, the Tenzing-Hillary Airport at Lukla is technically the world’s most dangerous airport, with numerous crashes resulting in loss of life in the past few decades. But the experience is so exciting and so beautiful with views of enormous mountains, farmland and sheer valleys you will forget the danger during the excitement of arriving here. Become a close friend with any Nepali guy and after a while, you’ll be offered some sort of local liquor, either chhang or raksi. Both are produced using rice, however chhang is less separated so has a smooth taste, milky color. Raksi is more refined, so it is a strong, clear alcohol that tastes much like Japanese Nihonshu (sake). However, You’ll most likely need your Nepali companions to purchase it for you. As it’s frequently simply sold in mineral water bottles at the nearby corner store. Always ask a local friend which ones are good. Or otherwise a stomach upset or even worse in inevitable. The Kali Gandaki Gorge, at 5,571m/18,287 feet is the most deepest canyon on the planet, and there are numerous ways to experience it. You can take a nail-biting flight from Pokhara to Jomson through the canyon, looking above and beneath at the mountains out of the window. 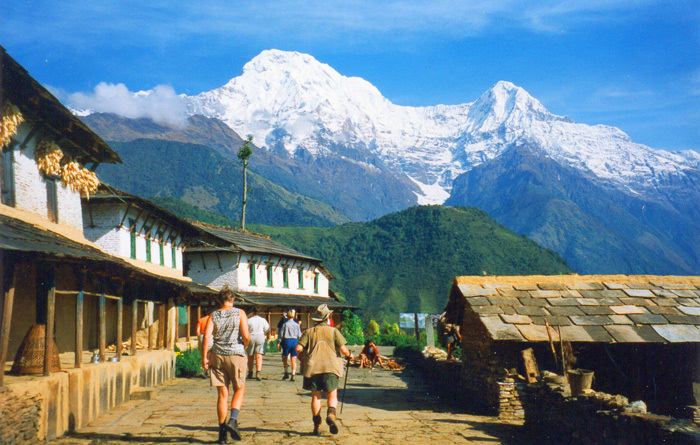 You can trek one of the many mountain trails of the Annapurna area that have to go through it. On the other hand you can whitewater raft or kayak down the Kali Gandaki River stream to clear view of the most stunning mountains on the planet. Until 2008, the Kingdom of Lo was a different kingdom inside Nepal. It turned into the Mustang District in 2008, when the entire parts of Nepal turned into a one republic. It has been a deliberately critical district for long time, as it is on a major trade route between China and India. Mustang was banned to foreign guests until 1992, and still requires a costly permit to go there (US$500 for 10 days). In any case, for the adventurer who do visit there, the well-preserved Tibetan culture and barren, windswept scene in the rain shadow of the Himalayas attempt advantageous. Cannabis is illegal in whole of Nepal (but you will hardly notice it). But at the time of Shivaratri celebration in March, it is every where and partially legal (although they won’t admit it). During these two days, youthful and old, male and female, smoke a joint or soak up cannabis “tea,” to respect Hindu Lord Shiva. In the shivaratri festival if you are in Kathmandu, you should visit the Pashupatinath Temple — the most powerful temple in the world, which can be a new yet vibrant experience, with the a huge number of sadhus who travel hither and thither around Nepal and India to get high and worship Shiva. Don’t worry if you are not in Pasupathinath Temple, Shivaratri festivities are held all over Nepal, so you can join with any group wherever you are.